Hello and welcome back! Today is THE day! It’s the release day at Taylored Expressions. All the new stamp sets, dies and embossing folders are released today. 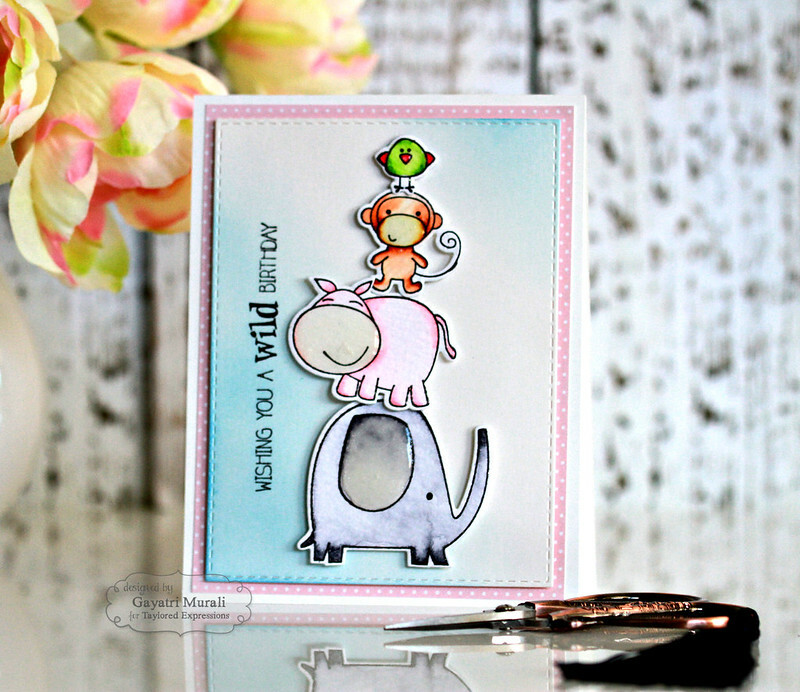 As part of the release day celebrations, I am showcasing Hippo Birdy Stamp Set and coordinating die set. This is an adorable stamp set. And great to have coordinating dies released for this set. Always love coordinating die sets. 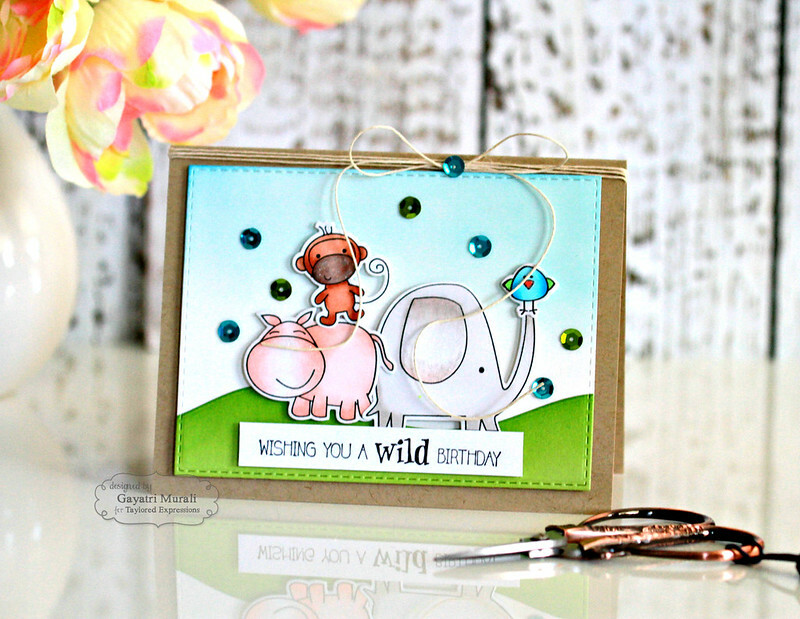 I have couple of cards to share with you using Hippo Birdy stamp set and dies. 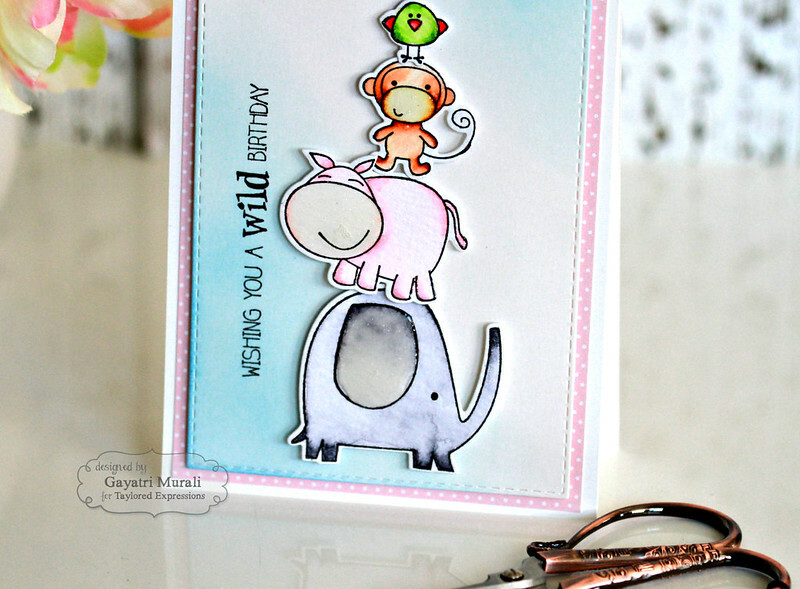 For this card, I black heat embossed the cute animal images from the stamp set on Ranger watercolor paper. Watercoloured the images using Zig clean brush pens. Once dry I die cut them out using the coordinating die. On a white panel die cut using Stitched Rectangle Stacklets, I sponged Salty Ocean distress inks diagonally opposite. Then black heat embossed the sentiment vertically. Next to the sentiment, I stacked glued the die cut watercoloured animals using foam for added dimension. to bring in more of the pink from the hippo, I added a layer of pink polka dot pattern paper from Hello Happiness 6×6 paper pad. I also added glossy accents on the elephants ears, hippo and monkey’s nose and the bird’s beak. 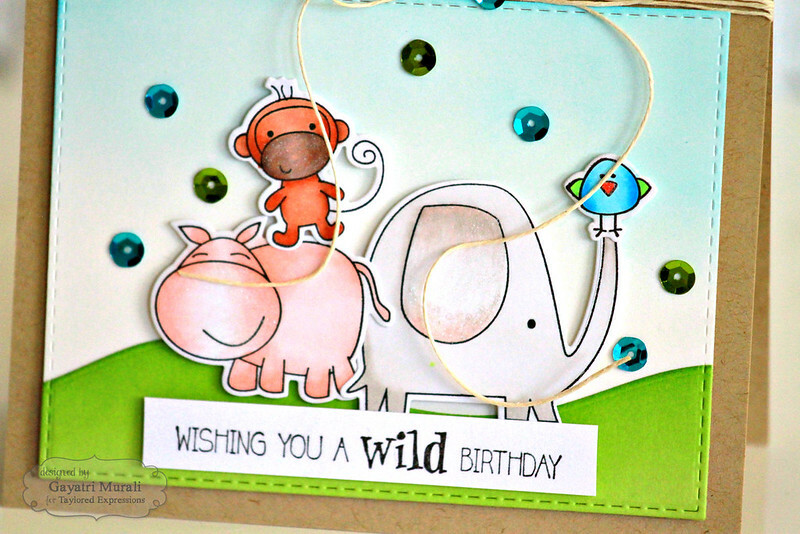 For this card, I copic coloured the animals from Hippo Birdy stamp set and die cut the animals using the coordinating dies. For the background scene, I die cut a landscape hills using one of the dies from Build a Scene Rolling Hills die set and Granny Smith cardstock. Then sponged Mowed Lawn distress inks to get depth of colours. I adhered this on a white cardstock panel. Then sponged Salty Ocean distress ink on top of the white panel for sky. Simple scene! Then I die cut this panel using the largest die from Stitched Rectangle Stacklets. This gave the entire panel a nice sitched edge. I then adhered the copic coloured die cut animals on the scene using foam adhesives. The same sentiment from the previous card is stamped on a strip of white cardstock and adhered below the animal cluster. I mounted this panel on a Toffee card base, wrapped natural twine to the top of the card with a big bow and embellished with sequins from Rainbow Brights. All the new release stamp sets and dies are now available for purchase from Taylored Expressions Store. For more gorgeous inspiration from Taylor and all the designers, please visit Taylored Expressions Blog. Such cute cards. Your sentiment goes perfectly with you cards' design. Both of these are adorable! Love the bright, happy colors and the critters! aww!! that soo cute ! !